We are starting to plan the design of our permanent history center in the Old Fair Oaks Library building. Although no decision has been made on availability of the property, we need to be prepared with an evaluation to determine what would have to be done to make it usable as a history center. An architect has volunteered to help with the evaluation. Unfortunately we have only a partial picture of what the old library looked like. If you have pictures, drawings or other reference documents, and/or good visual recall of the library facility, please let Jim Pearce know. Janet McWilliams is the Project Coordinator for our Portable History Exhibit. Members of the project team include Ann Dobek, Lois Frazier, Joan Larson, Jim Pearce, and Nancy White. They will be developing plans for the use and construction of the exhibit. Your help is needed as a Docent at the History Center. 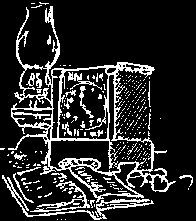 Please see Lois Frazier to sign up for a couple of hours on a Sunday afternoon. Have you paid your annual membership dues for 2009? If not, please mail your check to or see Trude Vasquez at the Registration Table on April 28th. The meeting starts at 6:00 PM. Come and bring a dish to share at the potluck. Invite potential members as guests and introduce them around. In the mean time, continue enjoying the beautiful Fair Oaks weather we are having. The Soup Night Committee is already hard at work planning for our Third Annual Soup Night fundraiser to be held on Friday, November 6th, at the Community Clubhouse. We have selected five delicious soups. Three brand new ones and two old favorites. Again this year tickets will be $25 for adults and $10 for children. They will be available for members at the general membership meeting in July. No tickets will be sold on Soup Night. In the mean time, we ask that you help by acquiring items for the auction and door prizes and give them to Marilyn Pearce. We look forward to seeing you at the April meeting. April's Program: Wayne Sanders from the old "Towe Auto Museum" reports it has a new name , the "California Automobile Museum." He plans to have a slide show with his presentation on the new museum. He will talk about the old museum and the changes that have been made to include a bigger and better representation of historical automobiles. 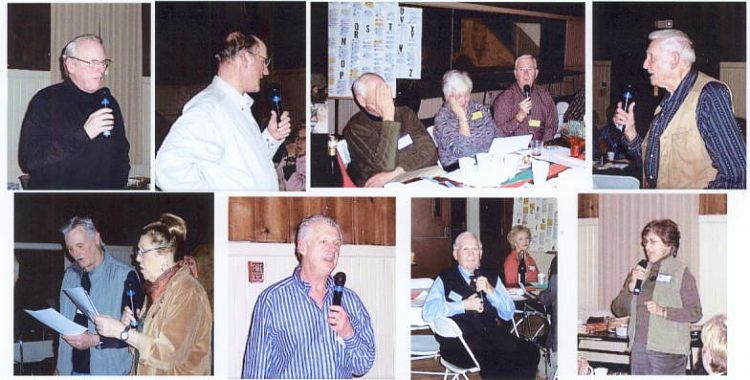 A Recap of January 2009’s Program: I would like to thank all members who participated in January’s potpourri, “Stories and Memories of Fair Oaks Citizens Who Touched Us.” We had so many participants speaking that it seemed like turning the clock back to hear stories of old friends. Gary Archer started the evening with his recollections of his Uncle Bob Massey. “Farmer Bob” has touched us all. He also spoke of his days working with Charles Kanoff at the Pharmacy. Russ Monroe reflected on his memories of Mary Nord and how she gave her life to volunteering in the Fair Oaks Community. Sherry Lynn Wood shared memories of her Aunt Ione Radonich and how she was everyone’s friend or adopted Aunt. Jim Ezell shared stories of Fire Chief George Payne. Ginger Poindexter shared memories of Bob Massey’s father Horace. Bob Brugger added his memories of Horace, the mailman with his right hand drive car. The car was great for delivering the mail and a wonderful conversation piece. Dorothy Huggett shared memories of Iva Langness, Dr. Archer and Dr. Applegate. Many members’ spoke up with memories of the two doctors, they were everyone’s doctors. Yes, Fair Oaks is still a small town. Maria Brugger talked about her father-in-law Frank Brugger, the rock plant manager for 50 years. She spoke of his kindness and caring for others. Warren McWilliams reaffirmed all that had been said, being a long time citizen of Fair Oaks, a Postman, and having a great memory as he knows and remembers much about those who lived in Fair Oaks. Larry Huggett talked of the Barber Shop and George Scott and Frank. He noted how the conversation seemed to change when he set foot in the Barber Shop, but it was always fun and friendly. On February 15, the History Center was open for a Girl Scout Investiture Celebration. There were 14 girls, troop leader Karen Terra, and 18 families in attendance. The 60th annual Fair Oaks Spring Fest will be on May 2 and 3rd. The History Center will be open to the public on both days from 10:00 AM to 4:00 PM. This year's theme is "Pirates of the American River". Docents will be needed for 2 hour shifts. Sign up at the Potluck. The Fair Oaks Cemetery will celebrate Memorial Day on Saturday, May 23, at 10:00 AM. The patriotic program will include speakers, bands, and the Fair Oaks Village Singers. The Historical Society with the Fair Oaks/Orangevale Grange will serve cookies and punch. We will need 15 people to bring 2 dozen cookies each. Sign up at the Potluck. The following people have been docents this year: Fran Sargent, Lois Frazier, Jean Applegate, Gordon and JoAn Heidt. THANK YOU! The meeting was called to order by President Ken Steen at the Community Clubhouse following a great potluck. Guests were introduced, Gary and Sandy Parrott, Charles Kanoff (new member). President Ken Steen introduced the officers and standing committee chairs for 2009. The officers for 2008 are all repeating for this year. Jim Pearce then announced that he and Marilyn were awaiting the birth of their first grandchild, Max who is arriving this very evening. Historical Moment: .Pete White introduced our own Gayle Anita, (helped by Hugh Gorman) who shared a ‘special’ version of “My Favorite Things.” Broadway is next for these special singers. Gary Archer started the evening with his recollections of his Uncle Bob Massey. He also spoke of his days working with Charles Kanoff at the Pharmacy. Russ Monroe reflected on his memories of Mary Nord and how she gave her life to volunteering in the Fair Oaks Community. Sherry Wood shared memories of her aunt Ione Radonich. Jim Ezell shared his recollections of Fire Chief George Payne. Ginger Poindexter shared recollections of Bob Massey’s father Horace. Dorothy Huggett shared her memories of Iva Langness, Dr. Archer and Dr. Applegate. Maria Brugger talked about her father-in-law Frank Brugger, the manager of the rock plant for 50 years. Warren McWilliams reaffirmed all that had been said. Larry Huggett talked of the Barber Shop and George Scott and Frank. Bob Brugger shared recollections of Bob Massey’s father Horace, the mailman with his right hand drive car. Treasurer’s Report: Treasurer Joe Dobrowolski reported that we are solvent. He also announced that copies of the 2009 budget were on the tables. Joe moved that we approve the budget, motion seconded by Lois Frazier. Motion passed. Claudia Thorn read a report from Richard Thorn stating that the books have been audited and found in order. History Center Operations: Lois reported that a display of materials from the Fire Dept. has been added to the Center. Docents are also needed for the months of May and July. Membership: Trude Vasquez reported that the Fair Oaks Chamber has pictures of all the events they have been involved in, they would be interested in sharing these with someone who would be able to journal these activities. She will be giving a membership report after the dues have been collected this evening. Soup Night Fund Raiser: Claudia Thorn requested that we return the evaluation forms for Soup Night. The committee will meet soon to start planning this years dinner. Announcements: June Melvin of the Woman’s Thursday Club announced that she has one Entertainment Book left at the price of $25. Ken Steen announced that the next general meeting will be April 28, the next Board meeting will be March 25th. Meeting adjourned at 8:05 p.m., followed by the remainder of the raffle. Several months ago, the FOHS received a request to help the San Juan High School Alumni Association set up an inventory of the memorabilia they have stored in a small room at the High School. I visited the room and decided to set up a computer program for them and do the inventory myself, since there were only about ten boxes to go through. Their purpose is to get their history straight in anticipation of a centennial celebration in 2013. I also attended the first meeting of the Centennial Committee, and when a history subcommittee is formed will probably represent the Fair Oaks Historical Society. Since other local historical societies will also be represented, it should be a fun experience. As the next three years go by, the Centennial Committee will be trying to get input from alumni, make digital copies of any historical photos or memorabilia, and collect any information from local "old-timers" who attended San Juan High School. I'll keep you informed of any specific requests. On the website, we've been getting complicated enough that members may have been missing new additions, so I decided to start a "What's New?" section which is up on the home page now. Irma Green Schlotz (91 years young) and her daughter Bonnie Roberts were interviewed on January 23, 2009 at their present home, 7991 Old Winding Way where they have lived for 60 years. Its history begins with Mr. & Mrs. Samuel Osgood, who gave the land and bought the "precut home" for their daughter Ethel (Iva Langness' aunt) when she married Bert Kerns as a wedding gift in 1916. They were the original owners. The Kerns lived in their home on then Main St until Mr. Osgood died. The couple then moved into Mrs. Osgood's corner home (FOB & Winding Way). In l899, Simeon (Sim) Green came to Fair Oaks with his family when he was 5. Part of his childhood was in the Smallwood Lane home (Issue Vol. 80 - Oct. '07). In '06-'07 Sim and Abbie and daughter Irma Green, age 5, rented for a few months part of the the home behind the Townhouse while the Kerns were transitioning out. 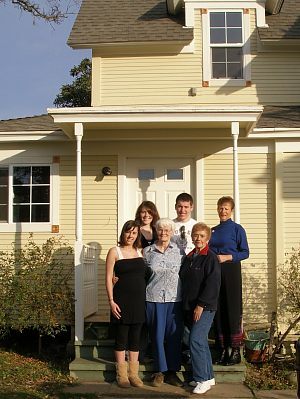 The Kerns sold their home (left photo) to the Greens. 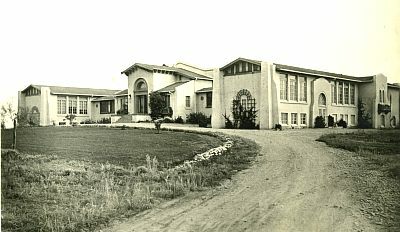 Between the 2 homes -Greens & Osgood/Kerns- there was an orchard with oranges and pomolos (grapefruit) where the dental building and parking lot are today. Sim owned the first row of fruit and the backyard was 1/4 acre with lawn and a garden that backed up on "Home Supply Lumber" which later became Diamond National, then the FO Water District Building. Irma remembers playing in the stacks of lumber. Her sister, Betty Rose was born in the home. The house had 2 bedrooms, a living-dining room, kitchen, basement, and sunporch in the back where Uncle Frank Beauchamp, foreman of the gold dredgers, boarded with them. Sim did add an extra room but was not a good carpenter. When making telephone calls through the operator, their number was 2. Sim planted the sycamore tree that is close to the street in front of the current business. The road was originally narrower so their frontyard was bigger. Sim and his Dad had a Ford Agency next to the Orange Packing Plant (about Sunrise and WW) but it burned down. He then bought the garage (Oaks Hardware) and did business there. Over the years, Sim was a great community member, serving as Associate Director of the Water District, active in Masons, on the board of the Bank, Rotary, Boy Scouts, school trustee for 18 years and elected Tax Assessor and Collector. All knew him in Fair Oaks! Irma married George Schlotz and moved away for a few years. When they returned to F.O., Bonnie, the oldest daughter was 4. George built the home Irma and Bonnie presently live in. The Green's sold their home to the Greenhills. Sim wanted to have a new home and built the cinderblock home at the corner of Old Winding Way and Bijan Ct. which is next door to the Scholtzs. On February 19, 2009, we continued the interview with Bob and his son Ken. Bob bought the property with Gill Campbelll in 1978 from Erma Greenhill. It had had renters prior to becoming a nursery. The prefab home had an inside stairwell, which was moved outside, 2 bedrooms upstairs as well as a bathroom. The back porch was redone and enclosed. Part of the home burned and was remodeled a couple of times. Both Bob and his family and younger daughter Tracey and family and then son Ken and family lived there. Bob bought out Gill in 1980. Ken and Christy took over the property as a commercial landscaping business, "Old Village Landscaping." Bonnie Roberts joined us for the visit (right photos) and hadn't been there since her teen years. Thank you to both families for sharing your stories! An update on the Chasko home on Orange Avenue from Ginger Poindexter, a Rice relative. She corrects us that Immer (born in 1886) and Muriel Rice came to Fair Oaks a SHORT time (not years) after his parents, Henry & Phoebe Rice. He did later go back to Minnesota but returned to Fair Oaks. Henry died in 1915 and was 34 in the 1910 census. Jane Whitnack, Marilyn, and Laurene Hyde, who grew up in the home before the Chasko's bought it, returned to the home for an inside view! 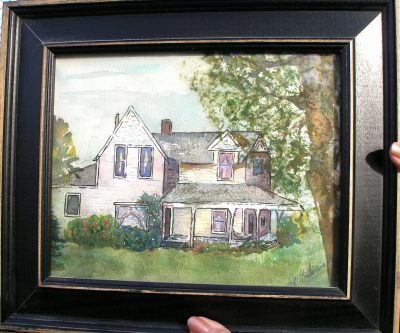 Laurene, a society member, brought a watercolor painting by her sister to show how the home had looked with the wrap-around porch and different front door. She had some funny stories to tell! Joe Chasko's children - Sarah, Jessica and Joe took us on a tour, answered questions and showed us how the property was laid out. We thank them for their hospitality and appreciated the pride they have in the home.